Colonial Village in 2 sentences: Colonial Village is a historic community sitting on a beautifully-landscaped sprawling green campus that features two and three-story red brick buildings. Layouts are small, yet efficient and provide a relatively low purchase price for a tremendous amount of value that the community has been providing its residents for over 80 years. Built between 1935 and 1940, Colonial Village was put in place to help house the workers in the federal government who moved to Washington under the New Deal. The community was the first large-scale apartment development backed by a loan from the newly-formed Federal Housing Administration. It had many opponents at first because some didn’t think government workers would want to live that far out from the city. Colonial Village remained apartments up until the early 1980’s at which point the community was divided into 5 different entities. Two of the communities became affordable housing complexes, while the 3 others that we will focus on became condominiums known as Colonial Village 1, Colonial Village 2, and Colonial Village 3. While all three (or all five) of these communities are known as Colonial Village, it’s important to understand that they are all independent of one another. While the three separate Colonial Village communities are all separate, they all look the same with a classic red brick exterior and are either two stories or three stories tall. Colonial Village I is located along the north side of Key Blvd as well as both sides of Rhodes Street, once you are north of Key Blvd. Colonial Village II is a full block and bounded by Wilson Blvd, Troy Street, Key Blvd, and Rhodes St. And Colonial Village III is the eastern-most community located along Wilson Blvd, Rhodes Street along the east side and down Queens Lane. The first thing you will notice about Colonial Village is that there is green space everywhere. The campus covers over 60 acres and provides nice walking paths, courtyards, garden areas, and jogging/biking paths. With all the green space, you will find that the community is very pet friendly. There are dogs everywhere. Check with the specific community to learn about any breed or weight restrictions, but a lot of people seek out Colonial Village because the community is pet-friendly. One downside of Colonial Village is that you are only going to get a few amenities. The community features common grounds that are professionally landscaped, common laundry rooms, and reserved parking. Some buyers and renters want a little more amenities but the community just was not built to support in-unit washer/dryer, underground parking, or other more modern amenities. The good news is that with less overhead, condo fees are a lot lower than surrounding communities. 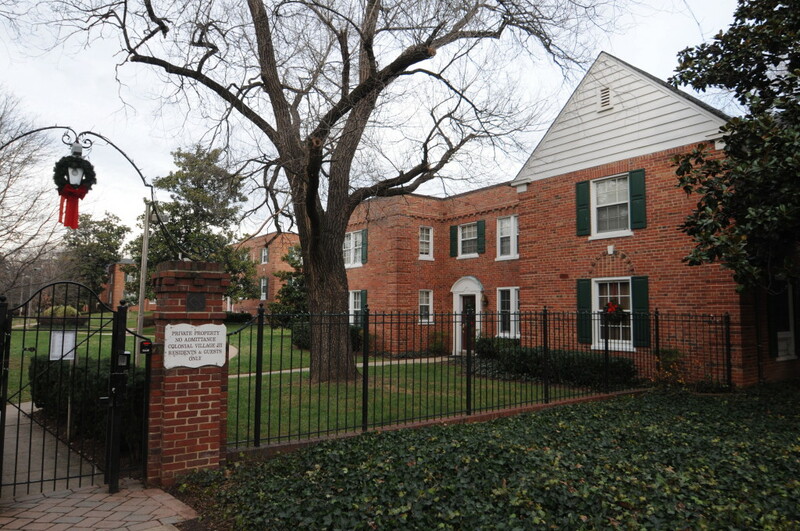 Colonial Village condominiums are going to vary from studios to two bedrooms. You will mostly see one and two bedroom units, all of which are going to have one bathroom. Floor plans tend to be on the smaller side. Think around 600-630 square feet for one bedrooms and 850-900 square feet for two bedrooms. Even though they are on the smaller side, there is usually a decent amount of closet space. Kitchens are going to get a little cramped. Some kitchens in the two-bedroom layouts will feature an eat-in kitchen that will open up the space, but for the most part, do not expect too much space in the kitchen area. One thing to take note of is some units feature what we call the “Colonial Village stack” where the cooktop is actually situated between the oven above and the dishwasher below. It’s kind of strange. You can probably live with it, but it is something to take note of to maybe try to avoid such a strange configuration in the kitchen. Thanksgiving dinner will have to be cooked at someone else’s residence (er, the turkey at least). Most units will have hardwood floors. Usually condos have lots of windows. And since there’s only two or three stories, in each specific building, you get a much smaller community feel seeing how Colonial Village (apartments included) is made up of over 1,000 residences. As you consider purchasing at Colonial Village in Arlington, remember that it is listed on the National Register of Historic Places. This means that restrictions are in place for renovations within your condo. Be sure to take extra precaution when replacing windows, removing walls within your condo, and any other significant renovations you plan on undertaking. If not documented properly, these changes could cause a big headache for you when you look to sell. Another take-away from Colonial Village is the parking situation. Some residents do not mind the parking, while others detest it. Colonial Village I and Colonial Village III each have their own off-street parking lot. When the lot fills up, there is street parking available for these two communities along with Colonial Village II (among other Zone 8 residents). Street parking can fill up quickly so there’s not a guarantee that you will always have your desired spot. In addition, you also have to back into parking spots, which can cause a problem to those who have not yet realized how much more efficient backing-in to a parking space is compared to parking nose-first. Colonial Village has stood the test of time and has proven to be a valuable community throughout the years. The community provides a great alternative to high-rise living and is also a great option for first-time homebuyers, investors looking for a rental property, and pretty much any buyer that is looking for simple, easy living along one of the most desired corridors in the DC Metro area.